In the previous post, Aqua-Blaze Part I, we left off in the middle of our grand Independence Day weekend adventure. We had rafts, a river to float down, more beer than we should’ve, burgers and hot dogs and a blissful ignorance to what we were getting ourselves into. It took us two days to make it 21 miles. Not bad, except that we needed to cover 130 more in the next five days if we were going to stay on track. Yikes. 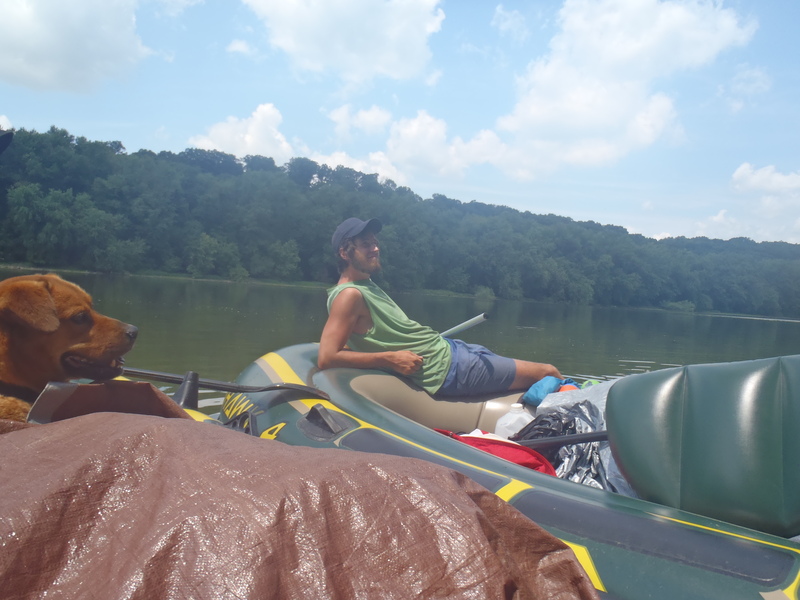 Clay, “Bullfrog” and Hunter paddling down the Shenandoah River. After the initial two days Brooke planned on heading back to work, like a responsible adult, and with her our access to the vehicle that had been our savior. Luck would have it that upon getting off the river at the end of day 2 we struck up a conversation with a person who turned out to be more than a hitch back to Brooke’s car but the Shenandoah River’s version of a trail angel. 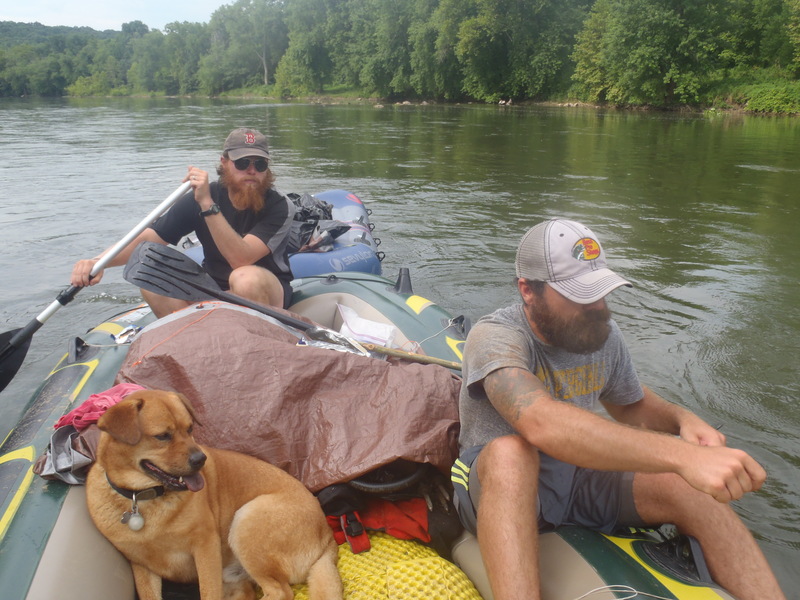 He had been paddling and floating the river for 15 years and gave us some much needed local advice; specifically about the twenty mile section coming up with two portages and rocks that would shred our boats. We took heed to his warning and it was time to make a decision; either we bail on the river altogether and have Brooke drop us off at the nearest trail intersection or we skip ahead 30 river miles and then commit to getting our rubber inflatables to Harper’s Ferry come hell or low water. The decsion had to be unanimous, and it was. We took advantage of our shuttle vehicle one last time and loaded 7 people, 6 backpacks, 3 rafts and a dog into and onto the roof of a mid-size SUV. We weren’t tight, we were packed in ‘I’m being sexually violated by someone’s foot an I don’t even know who it is tight’. We had one last BBQ with the remaining real person foods, and Fern Gully likes his burnt corn! Nonetheless, we made it back to the river and with a stop at a grocery store where we actually bought more food than beer we were ready to get down to business. Rafts are great for floating down a river and dinking beer. Rafts are awful for trying to propel down a river by paddling, especially with crappy $10 paddles. 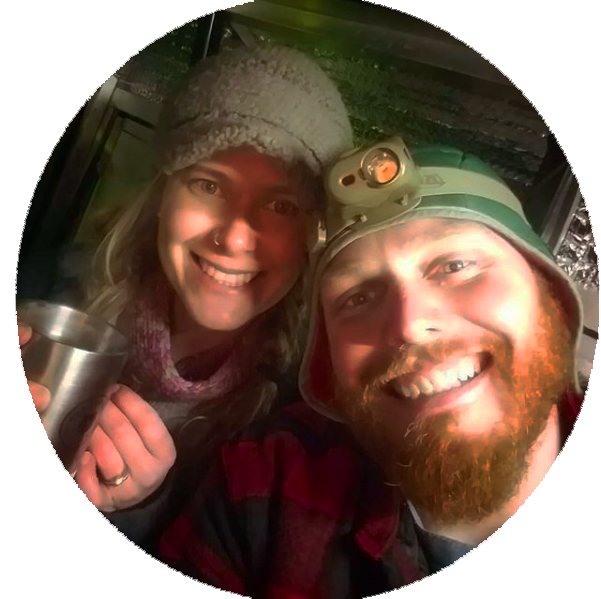 We were on the river for about ten to twelve hours a day and it seemed like we were paddling for half of it and trying to avoid dangerous raft-popping, trip-ending rocks either in rapids or shallow water the other half of the time. The sun baked us, heating the sides of the boats so much that you couldn’t touch them without first cooling it with river water. We emerged from the green tunnel to a shadeless waterway and despite numerous applications, they don’t make sunscreen with big enough numbers to keep some of us from burning. Turtle just chillaxin’ on the river. Okay, so I tried to make it sound much worse than it really ended up being. In all actuality when we didn’t have to paddle we tied the boats up and passed around gummy worms and bags of chips. We had music from a battery powered radio for the dull moments and enough rapids to keep things interesting. 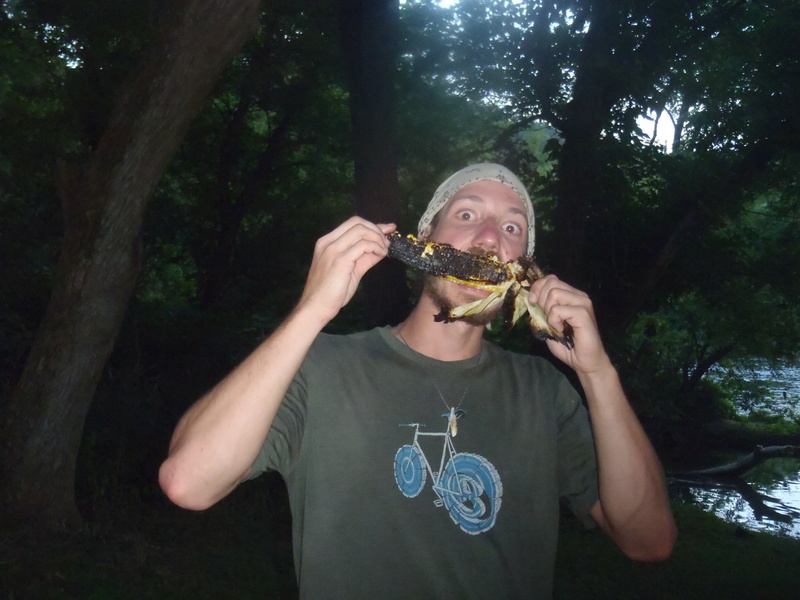 Hunter hung out under a makeshift sunshade all day and gladly leapt to dry land at the end to chase anything furry with his pent up energy while we enjoyed big campfires and Gully and Bullfrog spent the evening fishing. Our feet were able to rest and let our shoulders do the work, allowing some much needed recovery to happen. The only hairy moment of the whole trip happened with just two days left when a massive storm cell moved through. We went from blue skies to hail, 80mph winds, uprooted trees and booming thunder back to rainbows all in the span of 20 minutes. Seeing the storm front approach, the group decided to find a campsite and get our tents up before the impending rain, expecting a normal thunderstorm not the start of The Apocalypse. The rain came first, followed quickly by the hail and then the wind. The wind hit so hard that Lindsay and I had to push against the walls of the tent to brace it because we were afraid of it ripping apart. Fortunately about 30 seconds after we got out of our tent to run to safety in a nearby wheat field, as trees were starting to blow over, a 75lbs branch landed squarely on top of our tent. Our tent after straightening the poles. 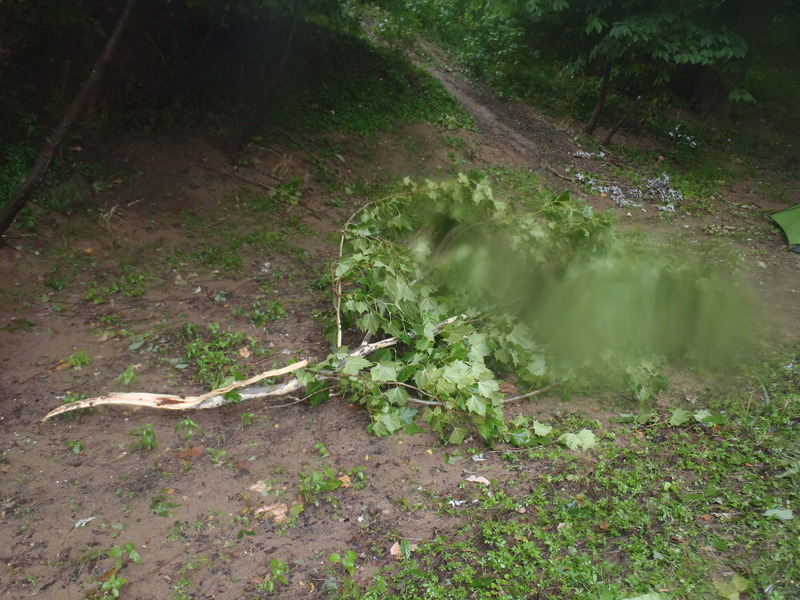 We would’ve had a picture of the branch on it… except for the fact that our camera was in the tent UNDER the branch! The branch at least made sure it flattened down the tent so the wind couldn’t damage it anymore. Then as quickly as it hit us, it stopped. No one was hurt by trees or debris and amazingly with a little Mainer ingenuity and a Leatherman I was able to fix our tent poles and we’re still using the same tent today. Thank you Mountain Hardwear. 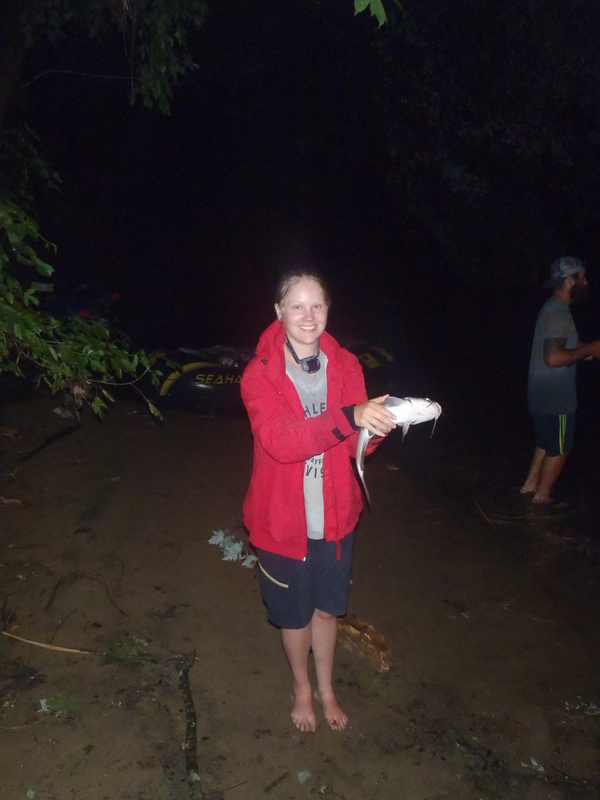 Chubby Bunny even landed a fish… with a little assistance! 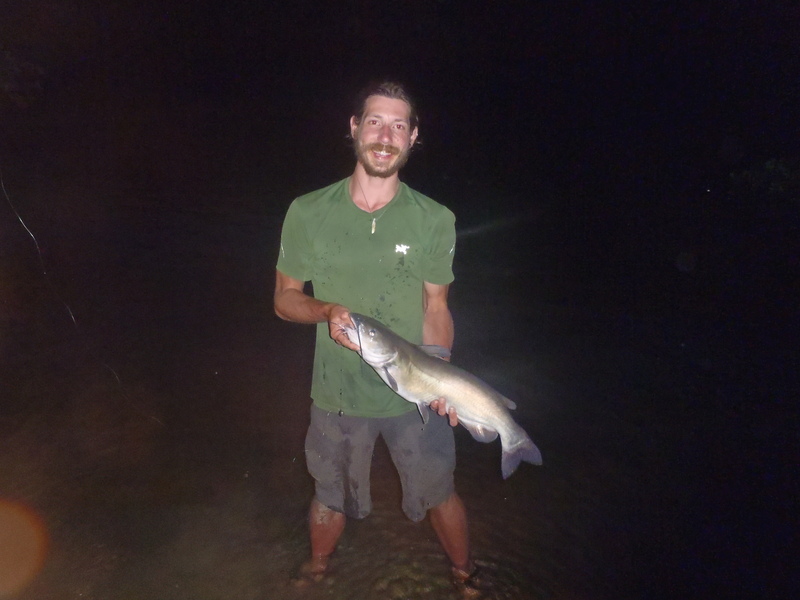 On July 10th we pulled off the river, 6 miles from Harper’s Ferry and arguably successful with a venture that only had a 50% chance of making it past day one. 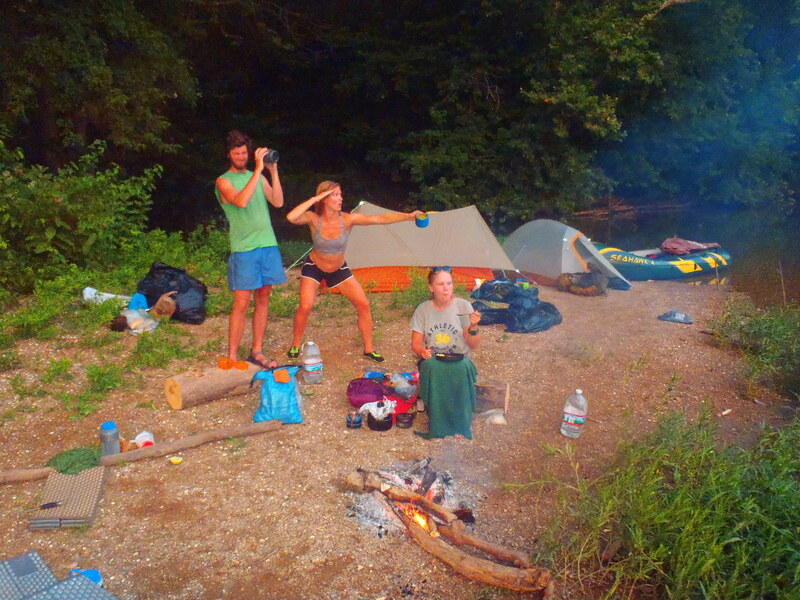 Because of a dam placed at the mouth of the Shenandoah River we were not able to make it all the way to our destination but rather than taking the easy way out and hitchhiking into town we put on our backpacks and walked the last 5.7 miles. Not all hikers own up to aqua-blazing but of the ones that have talked about it with us none of them made it as far. We pushed three rubber bricks down two rivers and accomplished our goal of making a true aqua-blaze given the limitations of our vessels. It took a little bit of help and a lot of luck but in the end we survived the sun, the river and a thunderstorm that tried to kill us; and for that I’m proud of our floating band of gypsies. 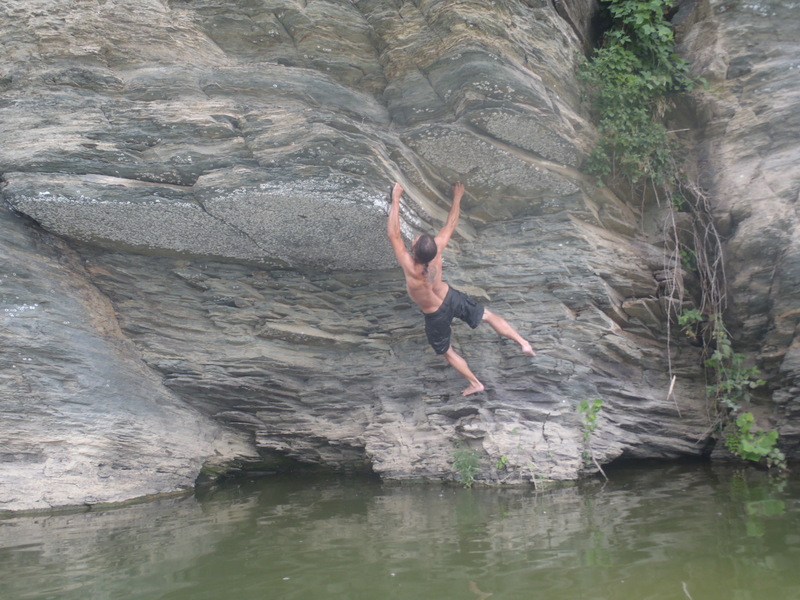 Fern Gully, doing a little rock climbing before we finished our river trip. As usual, love the story. I’ll be on that section of the trail next May, but I’m thinking I might stick to the white blazes. Thanks for scouting ahead for me. I assume you had a fishing license for pulling those fish out of our waters. Did you also have permission to camp on all a spots you stopped for the night with your big camp fires? It’s almost all private property along the South Fork of the Shenandoah River? Actually, yes we did have 5 day Virginia fishing licenses. 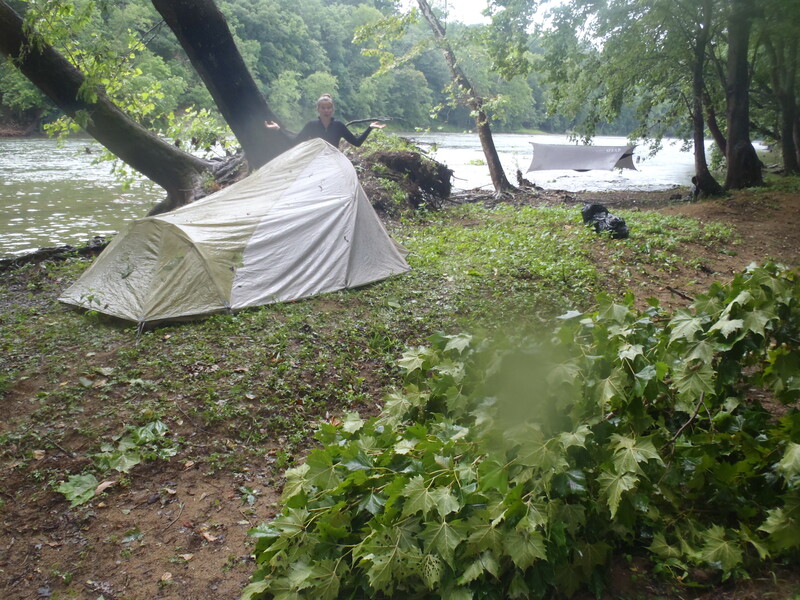 We also asked for permission at any of the locations on the South Fork or the main Shenandoah that were not public land, except for the banks of one hay field that we were forced to camp on because of the thunder storm that rolled in. Expecting the worst out of us “hiker trash”, huh? You are certainly the exception. Much respect for doing it the right way. Your example could go a long way to influence future hikers who want to Aqua Blaze. Thanks for checking back and seeing our reply. Hopefully some people use our “how to aqua blaze section” that we are writing this fall to do it right next summer.